Ship Weight : 28 lbs. 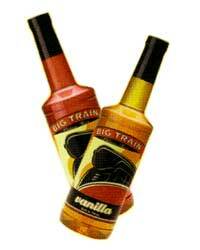 Big Train's flavored syrups are approaching their last stop on the line, get them while they last! Big Train has discontinued their flavor syrups. Not all flavors are still available and, of those, the remaining quantities are limited. Take your drinks to another level with these delicious flavored syrups! Create a delicious assortment of coffees, lattes, mochas, steamers, Italian sodas, & cocktails with the variety of flavors available in this case of 12 plastic bottles. INGREDIENTS: sugar, water, dutch chocolate, natural and artificial flavors, xanthan gum, sodium benzoate and potassium sorbate (to preserve freshness). This pump snaps into place on the Big Train syrup bottles. Simply press down to dispense one "shot" of syrup into your drink. This pump remains in place and replaces the cap.